The year 2018 was welcomed with full fervor and enthusiasm. While few pledged to leave some bad habits behind, there were those who vowed to adopt some good things. Among the latter, many have committed to stay fit and fine in this new year. If you are too among those who wish to stay fit as a fiddle, then here are top five smart devices apps to lend you a helping hand. Right from keeping track of your diet plan to monitoring your workout schedule, these apps let you do it all. Have a look! For circuit training, Sworkit is the app that you need to have on your smart device. It lets you set how long you’d like to workout. Whether you wish to workout to for mere five minutes or for an entire hour, you can adjust the time in the app accordingly. The exercises and workouts have been categorized into four broad categories. They are Stretching, Cardio, Strength, and Yoga. Apart from the categorization, the app also lets you build your own personalized workout. Select exercises from different categories and you are good to go. There are a total of 160 exercises to choose from. If you are not sure about an exercise, you can have a look at its video to know its proper form. There are both free and paid versions available for the app. 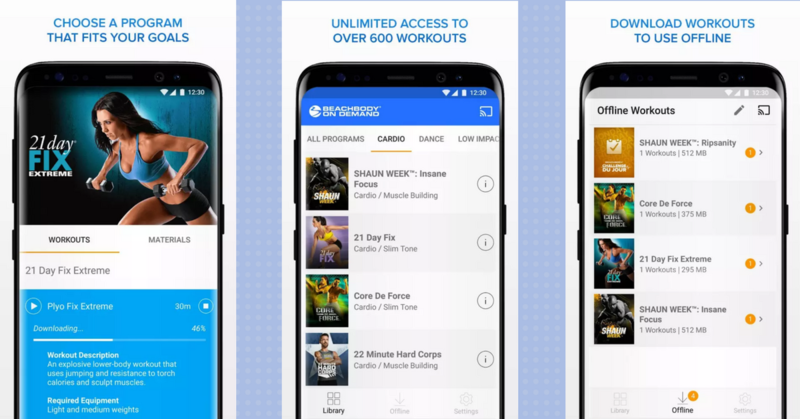 In its paid version, you come across many additional features like more exercises, a complete workout history, ability to sync with other fitness apps, etc. Don’t just exercise but keep a track too. Progression Fitness Trackers lets you undertake the tracking part seamlessly. There are hundreds of exercises available in the app. One can either build customized workouts from them or use them in their original form. The exercises have been bifurcated based on various parameters viz. alphabetically, equipment required, muscle group targeted, etc. Along with every exercise, there is an infographic attached which instruct the users on the proper form, equipment that are mandatory, etc. Also, there are links with every exercise which lead to videos on YouTube. Along with tracking, one can even sync the app with Google Fit. Though the app is free, its paid version allows you to check stats from various workout sessions, import and export data, etc. What started in India went on to become one of the best disciplines of exercise and meditation across the globe. Yoga helps you with flexibility, the strength of the muscle, posture, concentration, focus, and much more. However, if you do not have time to make it to the Yoga classes or tuition centers, then go for the Pocket Yoga app. The app consists of five sets of workouts. Each of the workouts is in a different background known as ‘environments.’ With the help of this app, you can choose the duration of the exercise, environment, and even the difficulty level. The USP of the app is its animated clips that show you the posture with proper audio instructions. Thus, do not hesitate in trying a new Yoga posture. There are other details too with every pose, for instance, difficulty level, description, benefits, etc. You can even buy new environments with karma points that you are rewarded with in case you practice for 15 minutes. Investing some time in Yoga poses is beneficial for your health. Practice them and stay fit with the help of this powerful yet elegant app. The fitness app - Calorie Counter - has been packed with plenty of features and functionalities to keep you fit and fine. The database of the app is brimming with 6 million+ food items. Make a healthy choice while finalizing your diet. There is a ‘Diary’ feature that has been integrated into it. Be it your breakfast, brunch, lunch, snacks or dinner, the app lets you log all of them in the Diary. When you allow the app to use your device’s camera, it lets you scan the barcode of various food items. On scanning, you get to know calories of the food, nutrients quantity, etc. You can even log this information in the diary. Diet and nutrition planning is an indispensable part of your fitness regime and Calorie Counter - My Fitness Pal lets you do the same seamlessly. This is one such fitness app that is perfect for those who are the newcomers to the world of fitness. It holds everything from simple Yoga poses to some of the extreme exercises. When you go for the paid version of the app, you get to see all the material of that exercise. Also, it shows you the equipment that are required and the food plans that you need to follow. There are video tutorials that you can either see from your smart device or see them with the help of your Chromecast. The apps above make it quite easy for you to undertake exercise and keep track of it. Choose any one of them for a healthy, fit, and fine 2018.